1. Preheat the oven to 170°C, gas mark 3. Pour 6 tbsp of water and the sugar into a small saucepan and bring to the boil, stirring continuously until the sugar dissolves. Then, without stirring, cook over a medium heat until the sugar turns a deep caramel colour (about 7 minutes). Divide between the bases of 6 x 150ml ramekins. 2. Place the milk, toffee sauce and a pinch of salt in a medium saucepan and bring to a boil, stirring until smooth. Remove from the heat and leave to cool for a few minutes. 3. Whisk the eggs and egg yolks in a large jug and very gradually beat in the toffee milk. Stir in the vanilla extract then pour over the sugar caramel in the ramekins, filling to the rim. 4. Place the ramekins in a roasting tin and pour hot water into the tin until it comes halfway up the sides. Bake for 25 minutes until just set. Remove from the water bath and allow to cool then place in the fridge for at least 2 hours or overnight until completely set. 5. 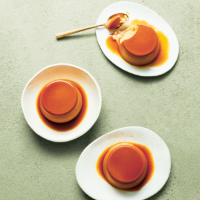 To turn out: run a sharp knife around the edge of the caramels to release then invert each onto a small serving plate.